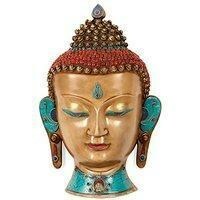 Resin Turquoise Stone Handmade Sculpture - Buddha Bust Home Decor Buddha to encourage peace and prosperity in your home. Buddha heads are not only famous for their spiritual as well as religious importance, but they also act as great pieces of decoration for you and your loved ones surroundings. They not only beautify the surrounding, but also spread the influence of peace and harmony around you. If you are looking for a great decorative piece, the Buddha head statues in our gallery may be the perfect piece for you and also a great gift for your loved ones who are followers of Buddhism. Buddha Head Mask is made of resin. Product Dimensions : - Size: - 15 Inch Height, 9.2 Inch Width. Weight - 1.7 Kg. Material - Resin & Turquoise Stone Inlay Handwork.